Hi everyone~hope you had a great weekend. I sorted all my scrapbooking paper and removed the paper that was more than two years old. That sure did make a difference, as I can see what I have now. This is a layout I did using Paper Studio. This was such a sweet time!!! 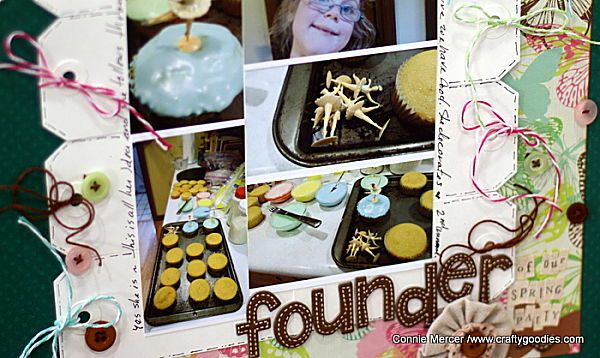 Adah and I made the cupcakes and all the decorations for the annual Spring Party!!! 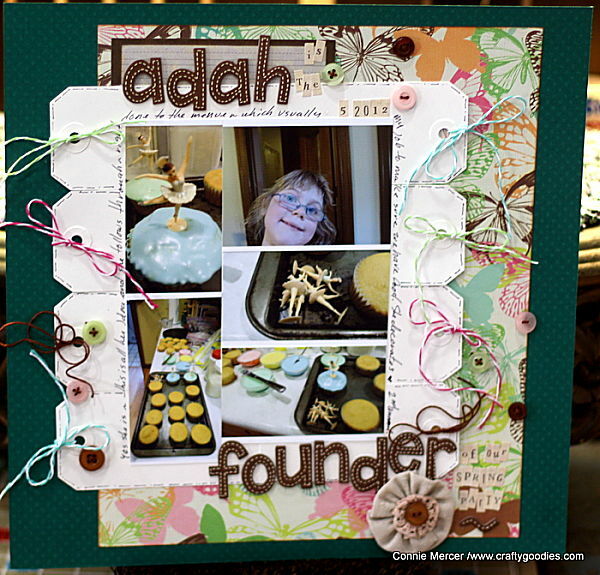 This was all her idea ~ so I named the layout "Adah is the founder of the Spring Party!" I also wanted to share with you a couple of WAY cool displays at the Collins Group Convention. 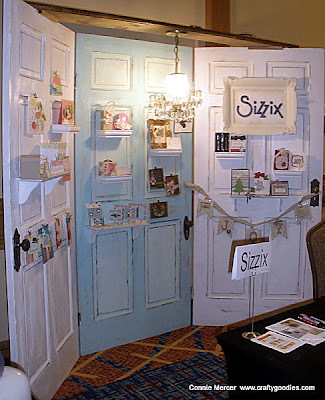 You know how I love doors so I had to take a picture of this beauty Sizzix put together!!!! This was a product display in the Farmhouse Paper Company's booth!! I'm gonna make one, mark my word!!!! So COOL!!!!! Hope you have a great day and I'll see ya soon for Try It Tuesday!!! Those doors are awesome. I love the little shelves, frame and banner. Your layout is so sweet. I love the tag background. I knew, before reading the piece beneath the photo, that you went crazy over the doors. LOL I hope when you make your display you will teach the rest of us. 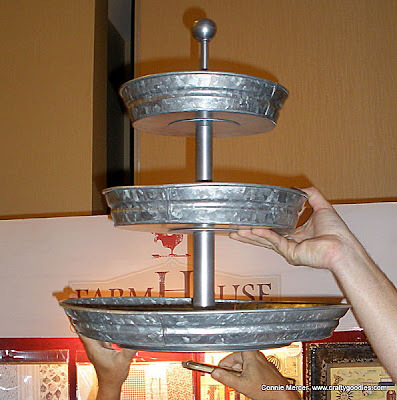 Love that 3 tiered metal stand...ohhh, the possibilities! Your lo is beautiful!! I loveeeeee the photos and all the tags!! And loving those displays!!!!! Look at all of those rockin' tags! Wow! Awesome page, Connie! love your layout...so cool how you used the tags..